Paw paw fruit Farming in Kenya is done in tropical and subtropical climates and pawpaw plants do not tolerate freezing temperatures. Papayas fruits are delicious and grow throughout the year. These fruits are eaten alone or in salad without the skin. The papaws fruits are low in calories and high in potassium, vitamin A and C.
Female plants –These fruit trees grow female flowers only. Female flowers are usually single blooms, bigger, and very close to the trunk. Male plants –These grows male flowers only. Male flowers have long, thin stalks with several small blooms. Hermaphrodites trees –These grows both male and female flowers. Therefore allow 4 plants per whole and later thin out to single trees when flowers appear. You may need to consult your gardening advisor for identification of the flowers. The solo variety which produces small round sweet fruits with uniform size and shape. It is hermaphroditic and popular for both export and local market. The mountain variety grows at high altitudes with small fruits only suitable for jam and preserves. The sunrise variety that produces smooth pear-shaped fruit of high quality, weighing 400 to 650 grams. The red royale that is an improved breed and give good quality yields. The vegetative propagated papaya using tissue culture resulting in superior plants that are disease resistant, high yields and are easy to maintain and harvest since the trees are short. Papayas require warm to hot climates for growth, and an altitude below 2100m above sea level, with annual rainfall of about 1000mm which is well distributed. The growing soils should be deep, well drained with adequate moisture, but not waterlogged. Growing of Papayas is by seed which are extracted from sound papaw fruits and healthy trees. Seeds of Papayas may be direct sown or grown in a nursery first. Papayas can be directly sown at 6 seeds per hole, and then thinned to four plants per hole after germination and reducing the plants to only one per hole after flowering. In plants where male and female flowers are born on different trees, male trees are allowed at the rate of 25:100 females as pollinators. Prepare raised beds measuring 1m wide and any convenient length. Pawpaw seeds are sown at a depth of 1 cm in rows which are 15cm apart. Water the beds heavily before sowing the pawpaw seed and regularly thereafter. Young plants are ready for transferring to the field at a height of 10-15cm. Plants are sown at a spacing of 3m x 3m in holes measuring 60cm wide and 60cm deep. Mix 18 kg of well decomposed manure with 60 grams of double super phosphate fertilizer and fill the hole with this mixture plus the top soil, and sow four papaw seedlings per hole which will be thinned out to one per hole at flowering. Firm the soil around the trees seedlings, then Top- dress with 40 grams of CAN fertilizer per hole. Apply 200g of CAN or ASN on individual papaws once a year at the beginning of rains. The Average yields of pawpaw trees are 30-40 tons of marketable fruits per hectare. The papayas are ready for harvesting when a yellow tinge grows on the blossom end of the fruits. Handle the pawpaw fruits with care as dropping or bruising lowers the keeping quality. 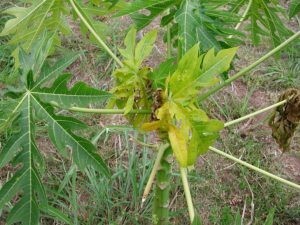 Windbreak: Papaya trees are very sensitive to strong winds; to prevent breakage, establish windbreaks before transplanting. A thorough land preparation is necessary for early crop establishment and adequate weed control. Slash, remove stumps and stones where necessary, and clear debris. Double plough, harrow and/or rotovate field to a fine tilth where necessary, line and peg. Nursery Practices: Seedlings are best raised in 12cm x 20cm black poly bags. Soil Media: Media for nursery can either be purchased or locally prepared. To prepare media, scrape away the topsoil, dig out sub-soil and moisten. Spread sawdust/rice husk on the sub-soil and burn slowly to sterilize. Leave to cool for 24hrs. Mix one part sub-soil with one part well decomposed manure. Soak seeds 48 hours to break dormancy. Stir and change water at least 2 times discarding non-viable floating seeds. Air dry seeds for 6hrs and keep in clean absorbent cloth for 3-4 days in a warm dark place for seeds to sprout before sowing. Make drainage holes in poly bags, and fill with media. Evenly sow 4-6 sprouted seeds at a depth of 1cm and cover with about 1cm of soil and firm. Water copiously. Arrange poly bags under shades. Cover with transparent polythene sheets. Remove sheets immediately after emergency (3-4 days). Apply 5g Mono Ammonium Phosphate (MAP) per liter of water on seedlings three weeks after emergence. Harden seeds by gradually reducing shade and exposing them to sun before transplanting. Thin out to 3 seedlings/ bag before transplanting. Planting out: Transplanting seedlings at a space of 1.8m x 2m (about 2,800 plants/ha) or 2m x 2.5m (about 2000 plts/ha) 4-6 weeks after emergence. Thinning out: Thin out to one plant per stand after the first flush of flowers appears, selecting only sturdy plants with hermaphrodite flowers. Routine weed control is recommended. Hand weeding where practiced should be shallow to avoid damaging roots. To maintain vigorous plant growth, irrigate during the dry season to achieve a total of 150 to 200 mm per month. (Consult your irrigation specialist for assistance). Supplementary irrigation (drip, under tree or micro sprinkler) is necessary to reduce incidence of flower abortion and improve yields all year round. Use soil analysis as a guide for fertilizer application. A general recommendation is to apply 114g of Triple Super Phosphate (TSP)/hill at planting and three spades full of well decomposed manure three times a year. Subsequently apply the recommended rates of fertilizer as presented below. These qualities may be increased/reduced depending on the results of plants/soil analysis and on the amount of manure applied. After flowering apply 25ml/15L knapsack of foliar fertilizer (high Boron and Calcium) every 14days. 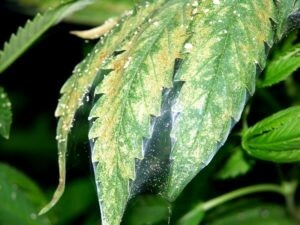 Spider mites & Thrips: Control with Sulphur 80WP at 50g/15L (3.3 -3.5g/L) and repeat after 5 days. Application should be early in the morning or late in the evening. Shake knapsack during spraying. Grasshoppers and crickets: Control by using approved methods. To control, use biological control agents and pheromone traps, Contact PPRSD/MoFA for bio-agents. To control, plant marigold (Tagetes spp) or croatalaria on the land 2-3 months before transplanting. Plough this into the soil as part of the land preparation. 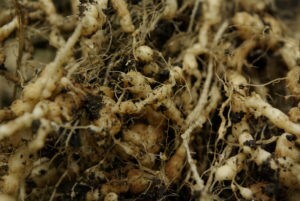 Well decomposed manures also help to control nematodes. Practice crop rotation with non-susceptible hosts. Obtain seeds from disease free fruits on healthy mother plants. Practice farm hygiene. Control using EPA approved fungicides. Die-back: Destroy all affected plants. Mosaic: Transmitted by Bermisia. Control vectors and rogue out all affected plants and burn. Damping-off (in seedlings): To control, ensure good drainage and improve sunlight penetration in the nursery. Bunchy top: Monitor fields and rogue out infested plants and control the vector. 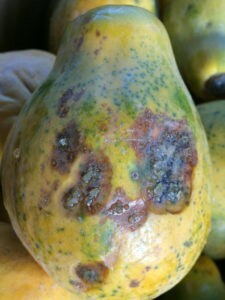 For black spots that appear on the fruit spray with an organic copper-based fungicide spray. For birds and fruit bats, pick the fruits as soon as they start to turn color. To reduce fruit rot and fungal problems, pick the fruit early and ripen it indoors. To get rid of fruit fly, hang fruit fly Traps around the trees. Fruiting/Fruit thinning: Where fruit set is too heavy remove some of the fruits to allow remaining fruits to develop properly. Overcrowded fruits are mostly misshapen. Fruits mature 8-9 months after transplanting. Harvest when color breaks (a tinge of yellow at the bottom end). Harvest in the cool hours of the day. Wear gloves and harvest into plastic crates to avoid bruising fruits. Economic harvesting may last up to 3 years. It’s appropriate time to make some plans for the long run and it is time to be happy. I have read this submit and if I may I desire to recommend you few attention-grabbing issues or advice. Perhaps you could write next articles referring to this article. I want to learn even more issues approximately it! I COME FROM NYAKACH IN KISUMU COUNTY AND WOULD LIKE TO START PAWPAW FARMING WHICH VARIETY IS BEST FOR ME TO CHOOSE FROM IN REGARDS TO CLIMATIC CONDITION IN MY AREA.